Above: The trinity of Haggis, neeps and tatties as produced by The University of Edinburgh's catering department. Each year on the 25th of January the poetry and life of the 18th century Scottish poet Robert Burns is celebrated by thousands of people around the world as a de facto Scottish National Day. Central to these celebrations is the Burns' Supper, where there is a recital of Burns' "Address To a Haggis" and the consumption of Haggis. By and large, the Haggis is always served with sides of Tatties (mashed potatoes) and Neeps (mashed swedish turnip/swede/rutabaga). Neither of these latter two items is mentioned by Burns in his poems, but the combination of these three items is now seen as essential, as they perfectly capture the essense of one aspect of the Scottish character, as described by Burns. Honest, uncomplicated, unfussy and egalitarian. Not that this has always been the case, earlier menus for Burns' Supper were rather more grand, with no mention of Haggis or neeps. In fact Haggis is only added to this very Scottish themed dinner menu in later editions of Meg Dods' "'The Cook's and Housewife's Manual". Given how central Haggis, Neeps and Tatties are to the modern Scottish national identity, how and when did this occur? Most sources on the subject state that in Scotland there is a root vegetable known as a "Neep", which is the same vegetable as the English "Swede". The popular explanation of this difference in name is that "Swede" is a contraction of "Swedish turnip", which distinguishes it from other types of turnips grown in England, whereas in Scotland, only this one type of turnip is commonly grown, therefore the "Swedish" bit was dropped and turnip was contracted to "Neep". As it happens, this is not correct. "Neep" is not a contraction, it is actually quite the opposite. The Old English for turnip is "næp" from Latin "napus" (turnip). "Turnip" basically indicates the round rooted nature of the Neep, just as "Pasnip" indicates a carrot/parsnip like Neep ("Parsnip" is the combination of the Latin "pastinaca" (carrot/parsnip) and Neep/Nip). Simple. The Scots are not the only people in the UK to use the term Neep, until the begining of the 20th century it was a common term in much of England. Most Scots that I know don't tend to use the term Neep, more often the vegetable is called a "turnip". So how does a turnip different to a swedish turnip? Is it simply a matter of colour? While it is true that most modern varieties of British turnip are white fleshed and Swedish turnips yellow, this is not definative. Some strains of turnip are yellow fleshed and there are also white fleshed swedish turnips. In 19th century Scotland it was the a yellow fleshed variety of turnip, not Swedish turnip that was especially prized. "Of turnips there are many varieties. Choose the pale yellow, small, fine-grained, juicy sorts. Pare off all that would be woody and stringy when boiled. Boil in plenty of water for from three-quarters of an hour to nearly two hours, according to the age and size. Swedish, four hours. Drain and serve them whole, or, if too large, divided, or, best of all mashed. A bit of the green top-shoot is left on early white turnips, and melted butter or white sauce poured over them. Swedish turnip-tops are delicate greens when young. If boiled in their coats, and then pared, old Swedish turnips will be more juicy." In fact while the two vegetables are very similar there are some very important differences. As noted above, the turnip (Brassica rapa var. rapa) was cultivated since ancient times, however the Swedish Turnip ( Brassica napus var. napobrassica) was first documented in the 17th century. The Swedish turnip is not simply a variety of turnip, but a complicated hybrid of a turnip and cabbage. As determined experimentally by the Korean botanist Woo Jang-choon in the 1930's, as the number of chromosomes differs between these two species, in order to produce a fertile hybrid between a turnip and a cabbage the chromosome content in any fertile progeny must be doubled. So a cabbage has 18 chromosomes, the turnip has 20, but the Swedish turnip has 38 chromosomes. This also means that the new hybrid is unable to cross breed easily with its parents. Thus, the Swedish turnip is a turnipy cabbage or a cabbagey turnip, combining traits from both parents. While Woo delibrately created these hybrids, it seems that the Swedish turnip was created serendipitously, prehaps no earlier then the 16th century. ".....the agriculture of Ayrshire was in a most wretched condition. There was scarcely a practicable road; the farmers' houses were mere hovels; the lands were overrun with weeds and rushes. The arable farms were small, for the tenants had not stock for larger occupations; the tenure was bad, and the tenant harassed by a multitude of vexutious services to the landlord. The land, divided into the croft or infield, and outfield, was either neglected or worn out by successive crops of oats, as long as they would pay for seed and labour, or by an ill-managed rotation of two or three successive crops of oats, one of bear (or four-rowed barley), followed by a year of rest. The wretched condition of the country may be judged of by the fact, that little butchers' meat was used by the farmers, except a portion salted at Martinmas for winter stock; porridge, oatmeal cakes, and some milk or cheese, constituted the chief of their diet. Even in the town of Ayr, containing from 4 000 to 5000 inhabitants, not more than fifty head of cattle were slaughtered annually. 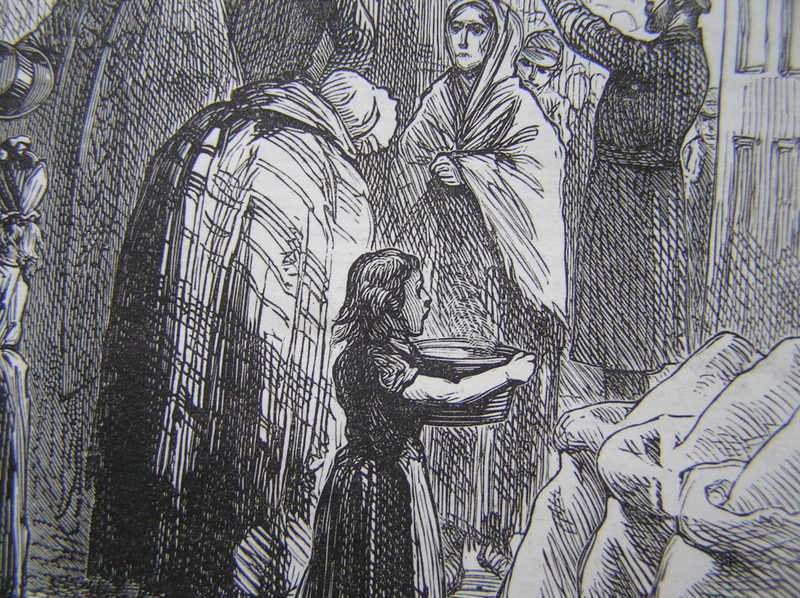 A succession of bad seasons, at the end of the seventeenth and beginning of the eighteenth centuries, obliged hundreds of families to fly for subsistence to the north of Ireland; and the poor were not unfrequently obliged to subsist by bleeding their cattle, and mixing the blood with any oatmeal they could procure." "Although, therefore, the practice of draining, enclosing, the cultivation of artificial grasses, turnips, and potatoes had been introduced by the middle of the last century to a limited extent in the south-east part of the kingdom, on the estates of some of the land proprietors who paid attention to agriculture, their example was not followed by the tenantry generally, who laboured under a great deficiency of capital, and who were unwilling to adopt changes till they saw them succeed when tried by men in their own rank. Green crops being almost unknown, fresh animal food could not be obtained during one half of the year. Each family salted in October or November its supply of beef till Whitsunday. If the cattle were alive in the spring, and able to go to the pastures without assistance, it was thought sufficient." "In the spring, their cattle were so weak, that when they lay down, they could not rise of themselves till they lifted them up. They fell into mosses and quagmires through weakness, and were drowned. In the spring season, it was a constant custom to gather their neighbours together, to assist in lifting their cows and horses, and to drag them out of moss holes." Most cattle had to be slaughtered at the begining of Winter, and those that were kept only barely made it through until the new feed grew in late spring. So weak were they that that had to be carried out to pasture. Traditional farming is not automatically kinder to animals then more modern methods it seems. Above: Turnips varieties; White, red topped, Swedish and green tankard types. "....until the introduction of turnip husbandry, all fat stock was, of course, grass fed; and if they were kept on during the ensuing winter, their condition fell off and had again to be made up in the summer of the ensuing year. Meat markets were thus only supplied in summer, and people were then content to eat salt meat all winter. Turnips at length afforded fat meat fed in winter, all of which was readily consumed at home, but, by the extension of their cultivation, a portion of the fat stock was exported to England. The southern counties of Scotland first cultivated the turnip, and, of course, first enjoyed the benefits of feeding cattle in winter." "Extract of a letter from a Gentleman in Scotland concerning the Ruta-baga. I Have introduced into this country the Ruta-Baga, or Swedish Turnip, conceiving that it might be of great use as an article of green food after the month of March, when usually our common turnips run all to seed, and we find ourselves at a loss for food until our grass grounds are ready; which they seldom are until the first week of May: hence my experience of this plant is mostly confined to the spring." "The Ruta baga or Swedish turnip, was introduced into this parish [Kilconquhar, Fife] about 4 years ago. Its leaves resemble the rib kail plants, the root resembles field turnip, not so large in general, but heavier in proportion to its size, and of much firmer texture. It is believed, that as great weight of this root may be raised on an acre, as of field turnip; this plant seems to be gaining ground here; it is proof against the most intense frost; the season for sowing it is from the 1st to the 20th May; it may either be transplanted as cabbage, or managed as field turnip." Extract of a letter from a Gentleman in Scotland concerning the Ruta-baga. "In winter I began taking up a few for my table; they seemed in general smaller than our common turnips, and longer, mostly of the figure and size of a quart bottle ; but twice as heavy as a turnip of the fame size. For their use for the table, I can confidently recommend' them as of superior flavour, so much so indeed, that after eating them none of my family would taste the other turnips." So not only did the Scots find the Swedish turnip edible, they found it delicious. In Edinburgh at least, the non-Swedish types of turnips had been part of the normal fair of high and low class Scots for centuries. Interesting, in addition to eating them cooked in various ways, they were also consumed raw - much to the amazment of the English. "In a dearth of fruit for dessert at the dinner-tables of the principal men in Edinburgh, an English traveller remarked that dishes of small raw turnips — called " neeps " by the natives — were eaten with avidity." "You know we used to vex poor Murray, of Baliol College, by asking', if there was really no fruit but turnips in Scotland. Sure enough, I have seen turnips make their appearance, not as a dessert, but by way of hors d'oeuvres, or whets, as radishes are served up betwixt more substantial dishes in France and Italy . But it must be observed, that the turnips of this country are as much superior in sweetness, delicacy, and flavour, to those of England, as a musk melon is to the stock of a common cabbage. They are small and conical, of a yellowish colour, with a very thin skin; and, over and above their agreeable taste, are valuable for their antiscorbutic quality." "Whae'll buy neeps? - neeps like sucre! whae'll buy neeps?" So from a late 18th century agricultural innovation, the Swedish turnip gradually appeared on the Scottish plate throughout the 19th century, and by the end of the 19th century we first see mention of Neeps and Haggis together. Robert Burns certainly would have known the "Neep", or turnip, but given that he died in 1796, only a few years after the Swedish Turnip had been cultivated in Scotland for the first time on a small scale experimental basis, it is very unlikely that he ever ate the modern dish of "bashed Neeps" (Swedish Turnips) that is now the staple of every dinner given in his honour. The introduction of turnip cultivation brought Scottish agriculture out of the Medieval and into the modern era and introduced a year round fresh meat and a new vegetable to the Scottish diet. However, there was another side to agricultural improvement in Scotland, that of the effect on the people that worked the land. Improved land that could support more animals for a small change in actual working practices resulted in a surplus of farm workers. 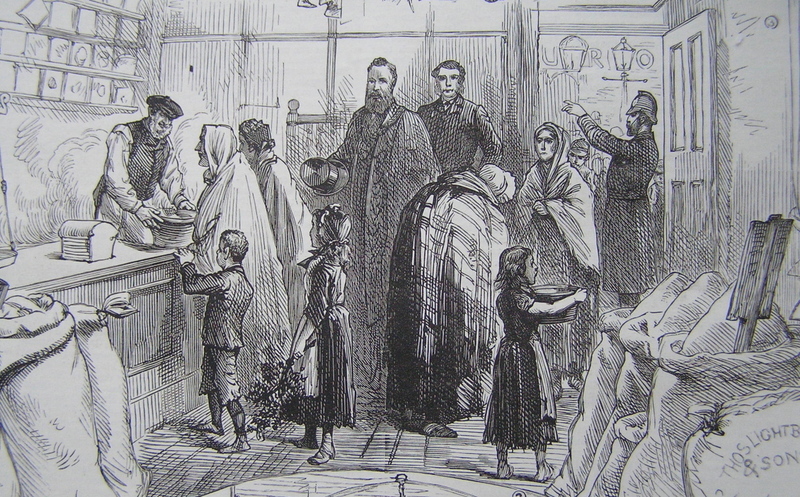 While it doesn't have the historical glamour of the Highland Clearances, the Lowland Clearances resulted in the displacement of thousands of Lowland Scots and the enlargement and development of towns such as Glasgow. Turnips replaced people, during the period of the later Highland clearances, Elizabeth Gordon, 19th Countess of Sutherland was able to write of her husband that "he is seized as much as I am with the rage of improvements, and we both turn our attention with the greatest of energy to turnips". One has to wonder what Burns, the Lowland Ploughman Poet, would have thought about the Neep in light of the fact that it greatly contributed to so many of the great social changes in Scotland that he observed and commentated on? The humble turnip, the most unfussy and egalitarian of all vegetables, yet within a generation of its introduction "tradional" Scots live styles changed forever. In general I don't have much of a sweet tooth, but in spite of this I am absolutely mad for Kendal Mint Cake. Of the brands made today the, I prefer the product of George Romney's. Sweet, but never cloying, hard and crisp, but always creamy. It remains a special treat when we go to the Lake District, when most other such sugary treats have been left behind in childhood. So what are the origins of this regional English product? Well according to legend it was invented by Joseph Wiper in the 1860's, when he ruined a batch of Glacier Mints. Although the ingredients are the same, Glacier Mints are a hard clear, glassy candy, where as Mint Cake is white, friable and crystalline. These differences are because of the how the candies are made. Sucrose sugar syrup boiled to 154°C and quickly cooled will form a clear, glassy candy, whereas sugar syrup boiled to soft ball stage (115°C) and continuously stirred will upon cooling will form a mass of tiny interlocking crystals, which give the candy the familiar crisp, but melting texture. Modern Kendal Mint Cake lists sugar (sucrose), glucose, water and peppermint oil as the only ingredients. As the formation of sucrose crystals is dependent on the of fructose and glucose in the sugar syrup, the addition of extra glucose will change the relative proportions of fructose to glucose and this is one way in which the degree of crystallisation can be controlled during the manufacturing process. While glucose was first named in 1838 (by Jean Baptiste Andre Dumas) and first isolated from grapes in the 18th century, its usefulness in candy manufacturing wasn't appreciated at first and oftens described by many sources as a form of adulteration. 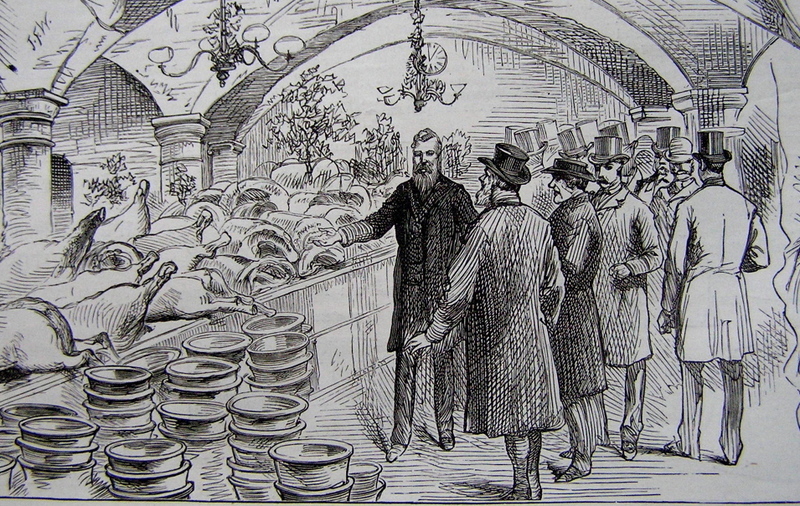 "grape-sugar, most abundant in the grape, but existing also in most fruits, especially in those with pips and kernels, figs, dates, gooseberries, various cereals, the stalks of maize, &c ......grape-sugar, the manufacture of which was attempted at one time in France, but is now for the most part abandoned, has proved of no practical importance. (1865). "Grape Sugar.—Glucose; Sugar of Fruits,.—This variety of sugar includes the sugar of grapes, of ripe fruits, of honey, and of seeds; together with the. sugars artificially produced from starch and woody fiberIt is more generally diffused in nature than cane sugar, and is the product of most plants which contain acids or sour juices. Grape sugar may be abundantly obtained from the juice of ripe grapes and pure honey, by washing with cold alcohol, which dissolves the fluid syrup. It may also be prepared by treating starch with sulphuric acid in the manner already described - sugar from this source has received the distinctive name of glucose, and is very largely employed in Europe for ordinary sweetening purposes, for confectionary, for adulterating" cane sugar, and for the manufacture of spirituous liquors by fermenting and distilling." (1868). "Cheap candies are not only often poisonous, but badly adulterated with terra alba, corn-starch, and starch-sugar or glucose" (1888). "Glucose is extensively used as a substitute for cane-sugar in the manufacture of table-syrup, in brewing, in confectionery, in making artificial honey, and in adulterating cane-sugar, as well as in many minor applications" (1886). So if Joseph Wiper did inventMint Cake at this time it would have been seen by many contemporaries as an adultered product. As it happens though he didn't invent Mint Cake. I have a manuscript cookbook listing recpes from towns in Lancashire and Cumbria, in this a recipe for "Mint Cake" of 1837 appears. 1/2 Ib Loaf sugar- same of Brown which are boiled with 1/2 teacupful of water. When sufficiently enough take it off the fire and have ready three pennyworth of Oil of Peppermint dropped upon moist sugar in a table spoon and stire it very well into the boiling ingredients which must be taked off & not put on the fire again but poured upon tins." In fact this isn't a particularly isolated recipe, although "Mint Cake" as the name of the confection is more restricted. In Scotland the same product as Mint Cake was know by the "Tablet", a confection name that is also locally restricted. Other names by which this confection was known were peppermint lozenges or drops. "In this Work will also be found the various methods of Sugar Boiling, and Directions how to make Barley Sugar, Lozenges, Paradise Twist, Peppermint Cake, Candied Ginger, Horehound, Lemonade, Peppermint, and all other sorts of Drops...."
Boil three pounds of raw sugar in a pint of water till you perceive your sugar candy round the pan side, then take your pan off the fire, and drop sixteen drops of the oil of peppermint therein, then pour it out into little round hoops made of tin, or butter a large piece of paper, and lay it on your stove, with a square frame on your paper, and pour your sugar on the paper, and it will become all over beautifully spotted, and you may with a knife cut it into what size or shape you please." Mrs Somerville's Cookery and domestic economy (1862) by Mary Somerville (Scotland). "PEPPERMINT TABLET. Put one pound of loaf sugar, broken in small pieces, into a small preserving pan; pour over it a breakfast cupful of cold water, stir it with an iron spoon over the fire gently, until it boils. Cover a baking tin, about half a yard square, with cartridge paper, brush it over with pure olive oil. Stir the sugar over the fire continually, for fifteen minutes, keeping it boiling moderately quick. When you feel it candying on the sides of the pan, remove it from the fire, and scrape the candied portions from the sides of the pan, strew in an ounce of powdered loaf sugar and oil of peppermint to taste, return to the fire, and stir it continually till it boils. Hold it over the fire for one minute, and pour it immediately into the baking pan which has been prepared for it. When cold score it with a knife in square tablets, when it is quite easily broken." The inclusion of peppermint in these early confectionery may have resulted in deliciousness, but in the main the intent was medicinal. Peppermint oil was said to have the properties of being "....stimulating and carminative, and is much used in flatulence, nausea, spasmodic pains of the stomach and bowels, and as a corrigent or adjuvant of other medicines. It is most conveniently given rubbed up with sugar and then dissolved in water". So this medicine was usually taken in the form of mint water, but for the sake of convenience was also used to make candies of various forms. Modern Kendal Mint Cake, famously used as an energy source by climbers and hikers, is a derivative of this process. The major difference between modern Kendal Mint Cake and the older confectionery was the inclusion of glucose to aid in the creation of a desired texture. Many families have their own particular traditions and mine is no exception. Every Christmas my Mother-in-law makes two special confections. One of which, "Coconut Ice", is quite widely known but the other has been something of a mystery. Called "Russian Toffee" by the family, these are pale brown squares which are sweet, rich and buttery, but unlike the similar looking fudge they have a firm and finely granular texture. As they quickly melt in the mouth, this gives the impresion of creaminess without being cloying. We knew little of the origin of this sweetie, other then that it was brought to Australia from Dundee sometime in the late 1930's and has always been thought of as Scottish by the family. So it was a great surprise when looking through a recently published Sri Lankan cookery book (the excellent "Serendip" by Peter Kuruvita) that I saw a photgraph of two Sri Lankan sweets that looked very similar to Coconut Ice and Russian Tablet. In this case the sweets were called "Coconut Rock" and "Milk Toffee". A little bit of research indicates that "Milk Toffee" is found in many parts of India and is especially popular in Sri Lanka. The interesting question is if there is any connection between these these two widely spaced group of sweets? In terms of a Scottish origin for my families recipe, once my wife and I moved back to Scotland, we found the exactly the same sweetie being sold all over Scotland. Exactly the same in all respects, except for the name. In Scotland the confection was sold as "Tablet". Until recently I have assumed that "Russian Toffee" was a self-conscience renaming of Tablet, so it was quite a surprise to find a recipe for "Russian Toffee" in the 1938 edition of "The Scottish Women's Rural Institutes Cookery Book". A little futher research indicates that "Russian Toffee" was hugely popular by the end of the 19th century and into the 20th century. Recipes are found in cookbooks as widespread as Scotland, Kenya, Zimbabwe and New Zealand. Above: an early 20th century hand wriiten recipe for Russian Toffee. Russian Toffee. – To make proper Russian toffee thick sour cream should be used, but condensed milk will answer the purpose admirably. Add half a pint of sour cream to one pound of sugar, and boil together until the mixture thickens. Add one teaspoonful vanilla essence and one tablespoonful of sherry. Boil again until the mixture leaves the sides of the pan clean. Turn into a oiled tin, and cut into squares when set. So what is the relationship of Scottish Tablet with Russian Toffee? "Tablet" is a celebrated and iconic sweetie in Scotland. Its early Scottish history is usually traced back to at least the begining of the 18th century where the household book of Lady Grisell Baillie (1692-1733) mentions the purchase of "taiblet for the bairns". The two earliest Scottish cookbooks, Mrs McLintock's "Receipts for Cookery and Pastry-Work" (1736) and Mrs CleLand's "A New and Easy Method of Cookery" (1755) give very similar recipes. Essentially sugar is boiled in water until it begins to form a candy, flavourings (Cinnamon, rose, orange or ginger are common) are added and this is poured out and as it sets in is marked to break into squares. Some recrystallization of the sugar is mentioned as important, especially if the boiling mixture is rapidly mixed just before it is ready to be poured, this would give a granular texture, not unlike modern "Kendal Mint Cake". While the modern Scottish confection is called "Tablet" these older recipes mention "Tablets" and this gives the clue to the origin and purpose of these confections. Above: the fine granular texture of Tablet. In fact the early recipes for Tablet(s) are not so much confectionary in the modern sense, but rather medicine. Lady Baillie's "taiblet for the bairns" may have been appreciated by the children for its sugar content, but its primary purpose was medicinal. This 18th century recipe from The Edinburgh Pharmacopoeia demonstrates how these Scottish Tablets straddled the line between medicine and confection. .....The sugar of roses was formerly made, by boiling a pound of fine sugar with four ounces of the juice of red roses, over a gentle fire, till the juice was almost all evaporated ; then throwing in an ounce of dry red roses reduced to a very fine powder; after which the matter was poured out upon a marble, and formed into lozenges. ....These preparations are chiefly valued for their agreeableness to the eye and palate. .Some likewise esteem them, medicinally, as light restringents; and look upon them, not undeservedly, as an excellent addition to milk in phthisical and hectic cases. " In most of Britain the term "Tablet" was dropped in as a term for confectionary during the 19th century, but in Scotland its use continued into the present era. These pre-20th century Scottish Tablet recipes do contain milk or cream, this now standard additon (mostly in the form of condensed milk) seems to have occured in the early 20th century. The 1938 edition of "The Scottish Women's Rural Institutes Cookery Book" gives an indication of how this inclusion occured, giving very similar confectionary recipes for "Russian Toffee", "Swiss Milk Toffee" and "Swiss Milk Tablet". "Swiss Milk" is simply condensed milk produced by Nestlé. The main difference between these early Toffee and Tablet recipes was not the ingredients, which varied slightly from recipe to recipe, but in the technique. In the toffee recipes the ingredients were often boiled to a higher degree then Tablet, and in Tablet recipes the mixture was always well beaten just before boiling, giving the characteristic granular texture of earlier non-milk/cream Scottish Tablet. Later the two recipes converged so that in my families recipe for "Russian Toffee", the mixture is also well beaten to give a granular texture. In effect "Russian Toffee", Swiss Milk Toffee" and Tablet are now all the same type of confection, with the usual variation in recipe to recipe that you would expect from an item that is still largely produced on a domestic, rather then commerical scale. So why "Russian Toffee"? According to the Glasgow journalist and writer John Joy Bell, a "Mr. Assafrey had just invented, compounded and produced the first Russian Toffee". A. T. Assafrey was born in Estonia and became ran a well know confectionary business in Glasgow (establish in the 1870's) who produced Scotlands first chocolate. It seems that Assafrey's produced a locally famous confection known as "Russian Toffee", this was copied by other Glasgow confectioners and a recipe for Assafrey's "Russian Toffee" was then published in "The Queen Cookery Book" series (1902). Other Russian Toffee recipes were widely published within the next three deacdes. After the 1950's the term "Russian Toffee" seems to have been largely dropped in Scotland, although still remembered by older people as a special treat. Confectionary made by boiling cream (sour, fresh or condensed milk) and sugar is still made in Russian and throughout the Scandinavian and Baltic States, where they are known variously as "kinuski, tšinuski, russisk fløtekaramell, rússnesk rjómakaramella, rysk gräddkola or тянучка". In other words "Russian Caramel". Many of these recipes now also substitute condensed milk for sour cream. So it would seem that thanks to Mr Assafrey, in Glasgow a cream toffee was introduced at the end of the 19th century and this recipe is likely to have influenced the development of Tablet in the early 20th century. This is not to say that modern Scottish Tablet is simply a redeveloped version of Assafrey's Russian Toffee. This isn't simply the case of a direct linear descent, more the combination of several well established recipes to produce somthing new. There are likely to be more contributing factors in the development of modern Scottish Tablet then I have mentioned here (how do other similar confectionary items like "Helensburgh Toffee" fit into the story for instance?). However, at its most simple it seems modern Scottish Tablet is the combination of a widely known European technique for making cream toffee, combined with a Scottish technique for producing a granular textured confection. This new style of Tablet was so popular that it is now the only variety of Tablet in Scotland that is made commonly. In reference to the original question of whether there is a connection between the Scottish and Sri Lankan confections, well both Cream and Milk Toffee recipes are common in Anglo-Indian cookery books at the end of the 19th century and into the 20th century. "The Ceylon Daily News Cookery Book" (1964, first edition 1929) gives recipe for both old style Scottish Tablet ("Peppermint Tablet", Rose Tablet") and Milk Toffee using condensed milk (and also a Coconut Milk Toffee). Is this a case of the Scottish Dispora disseminating recipes from home or simple coincidence? Did the various Milk/Cream Toffee recipes published in 19th century Anglo-Indian texts influence the development of Scottish Tablet? It would be interesting to fine out. One of the great pleasures of researching food history it is being able to get a feel for the evolution of a particular cuisine. A food culture can remain seemingly static or change ever so slowly over many decades, then develop into something unrecognizable to earlier generations within a handful of years. The driving forces behind these changes are some of the most interesting issues in food history. The introduction of a new technology or technique can have profound consequences, but often as not the reasons for the uptake, persistence or rejection of a particular dish is much more nuanced. In the English tradition cookbooks have had a profound influence on the nations diet. Unlike many other European nations the English have produced a huge number of cookbooks from 16th century onwards. While the French produced few if any new cookbooks between 1560 and 1650, in England at least 26 new titles and dozens of reprints were published. One consequence of this abundance of in food texts is that in reading through manuscript recipes collections it is possible to see treasured family or even regional dishes that have their origin in a popular period cookbook. I have been shown the original family recipe for preserving ham from a famous regional producer, this turned out to be a copy of the recipe in Mrs Rundell's "A New System of Domestic Cookery", the most popular cookbook of the 19th century. On question that I have always had is why does a particular recipe become popular and while others do not? An interesting point of comparison is pilau v couscous. Pilau rice dishes known under various spellings (pillaw, pellow, pelow etc) and identified as Turkish or Indian have been appearing in English cookbooks since the 17th century. In later recipes cooked meat was covered in rice and garnished with sliced hard boiled eggs and fried onions, however by the 20th century the origin of this rice dish had been forgotten and the under the name of either a "Pillow of Rice" or "Pillar of Rice" this dish had become a regional recipe in Suffolk. In 20th century sources the name "pillow or pillar" was attributed to the shape of the dish, essentially a cooked meat filling (game in Suffolk) was enclosed in a casing of boiled rice, this was shaped into a pillow/pillar, glazed with egg and baked until golden brown. Finally after four hundred years in England this dish seems to have died out in the late 20th century. Couscous on the otherhand has a very different history in English cookery. While it has been described in English texts since the 17th century, very few recipes have been published in English until the late 20th century. The earliest couscous recipe in English that I have found was from Charles Carter's (1730) "The Complete Practical Cook". In the glossary of this book "Cuscasooe", is described as "a Dish of Capons done either with Sagoe or Vermajelly", the reference to Sago is likely to be due to the fact that 17th century English descriptions of couscous describe it as "resembling sago", in other words round balls of starch. What ever the case, Carter's recipes is actually for rice, not couscous or sago. The next recipe for couscous in an English texts appears almost 100 years later in an unusual and anonymous 1827 work, "Domestic Economy and Cookery, For Rich and Poor"
Mix some of the finest dry sifted flour in a mixture of yolk of egg, warm water, and butter ; or water, cream, or milk, and granulate it with the points of the fingers amongst dry flour, till it takes a proper consistency. Prepare a fowl very nicely for boiling, boil the gizzard, slice it nicely, without detaching it, blanch the liver, put them into the wings, and lay the fowl into a saucepan that will just hold it, with a steamer fitted to it ; season it with mace, white-pepper, and lemon zest; put in a little water or milk, and put the steamer over it, with the granulated flour or cuscussou; make it boil, and leave it in the embers to steam till it is thoroughly cooked ; in the mean time prepare, according to the quantity, hard-boiled eggs, coloured with saffron ; dish the fowl, pour the cuscussou over, and stick the eggs in at proper distances. Any other meat or fish may be so cooked, or with rice, instead of the cuscussou." These recipes remained gastronomic curios, making little or no impact on the British diet. This is not to say that during this period that educated and informed authors did not know of this dish. The Scottish author Meg Dods writes "It would be very easy to swell this section of the MANUAL with a formidable array of uncouth dishes and strange names,.......Yaughs, Kabaubs, and Cuscussuies, &c........but this we consider mere waste of space.." Over one hundred years after this 19th century text, "Moorish Recipes" by John, Fourth Marquis of Bute was published in 1954, again with little impact. In fact it was not until after Paula Wolfert published "Couscous and Other Good Food from Morocco" in 1973 that couscous began to become something other then a curiosity. My own first experience of couscous was in Burgundy, France in 1996, not many Australians would have know about this dish at this time. Now instant couscous is on most supermaket shelves in the UK and has become a staple starch. So why wasn't couscous more popular in England prior to the last 40 years? I think that the simple answer is that it was complicated to make and required a cooking technique (steaming) that was not used in England to great extent. This is now longer and issue instant couscous, infact I believe that the popularity of instant couscous is less about a later 20th century interest in exotic cooking and more about the ease in which this dish can be produced. Instant couscous can be cooked with boiling water alone in 3-4 mintutes, no other starch comes close for ease of use. For this reason I think that couscous will be part of the British diet for a long time to come, what will be interesting will be to see when, if ever, it will be considered a "British Dish".